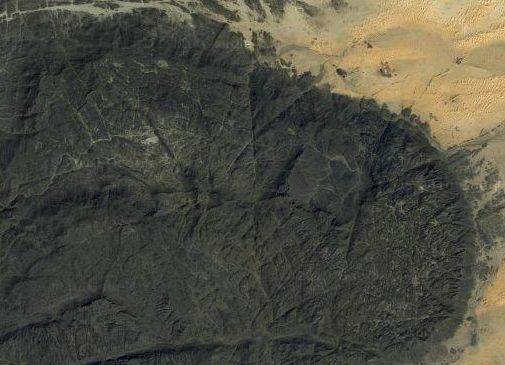 The Aïr Mountains in Niger, also known as the Aïr Massif, have been described as being tectonic/volcanic peralkaline granite intrusions of Precambrian origin[1,5]. C. Moreau, et al. describe the ring complexes in Aïr as having been formed during a major magmatic event in the Palaeozoic and provide a tectonic model using control by lithospheric structures for the emplacement of the ring complexes. However, the circular features of the landmarks, and the overlapping rings of the circular features can be explained as the result of impacts by a dense cluster of meteorites, rather than as the result of endogenic geological processes. 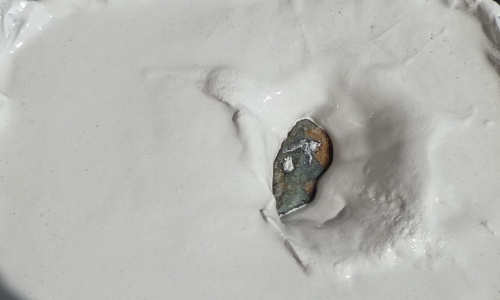 The presence of diagnostic shock-metamorphic effects or the discovery of traces of meteorites is generally accepted as the only unambiguous evidence for an impact origin, but geophysical and structural methods, as well as physical modeling can serve to detect candidates for possible impact structures. This paper describes a hypothesis of how the observed features could have been created by a series of closely-spaced meteorite impacts all of which occurred within approximately one minute. The hypothesis makes use of 1) observations of apparent impacts along a line of flight that would be typical of a meteorite cluster, 2) consideration of the results that would be produced by the impacts of objects of different sizes on top of each other, and 3) explanation of the observed overlapping ring structures on the basis of the behavior of fluids subjected to impacts. To test the application of the hypothesis, the interaction of each of the overlapping circular areas of the Aïr Mountains is examined to determine the sequence in which they were formed, and thereby determine the sequence in which the meteorites of the cluster impacted the Earth. Also, the characteristics of physical models are compared with the terrain features of the Aïr Mountains to identify their similarities. The circular features around the town of Inignaoueï in northern-central Niger include an almost perfect circle approximately 60 kilometers in diameter with a protrusion near the center that could mark a point of impact. 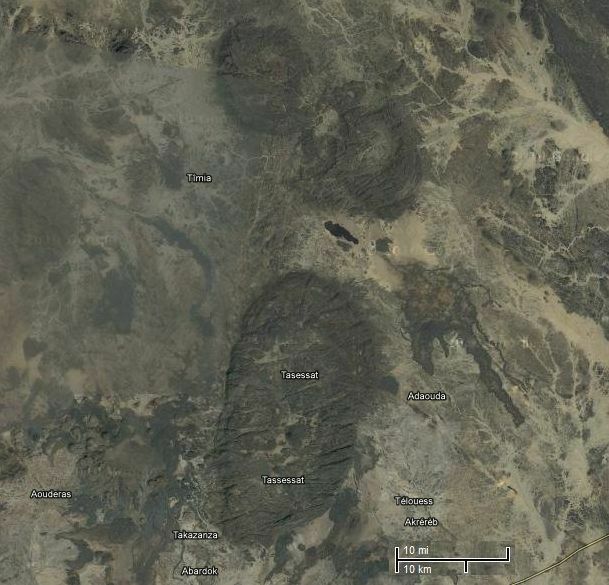 There are additional areas 125 kilometers to the South near Tassessat, Niger. 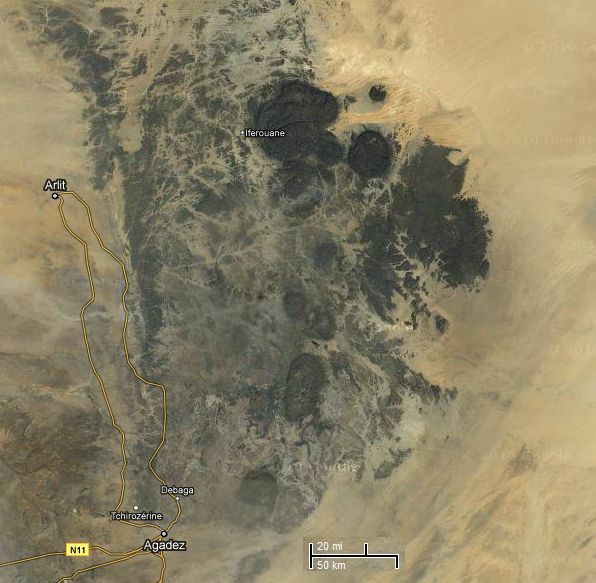 Two large areas 60 kilometers to the East of Inignaoueï also show circular outlines that have become less defined through erosion and lava flows from higher elevations. 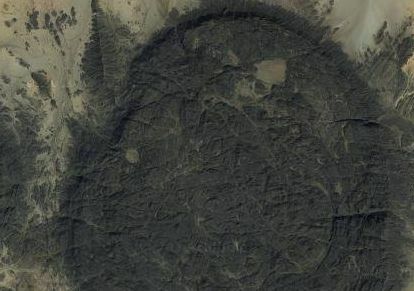 A more detailed view near Inignaoueï, Niger shows a cluster of circular patterns. Place cursor on the image to highlight the circular areas. The largest of the circular areas, Inignaoueï-5, is 60-kilometers wide with its center at Latitude: 18.820749, Longitude: 8.75553. The Northwest edge of the area is a very distinct circular arc located at Latitude: 19.072668, Longitude 8.602214. The Southeast edge of the area is a fainter circular arc at Latitude: 18.652018, Longitude: 8.980622. The following table lists the highlighted impacts and the coordinates of their centers. 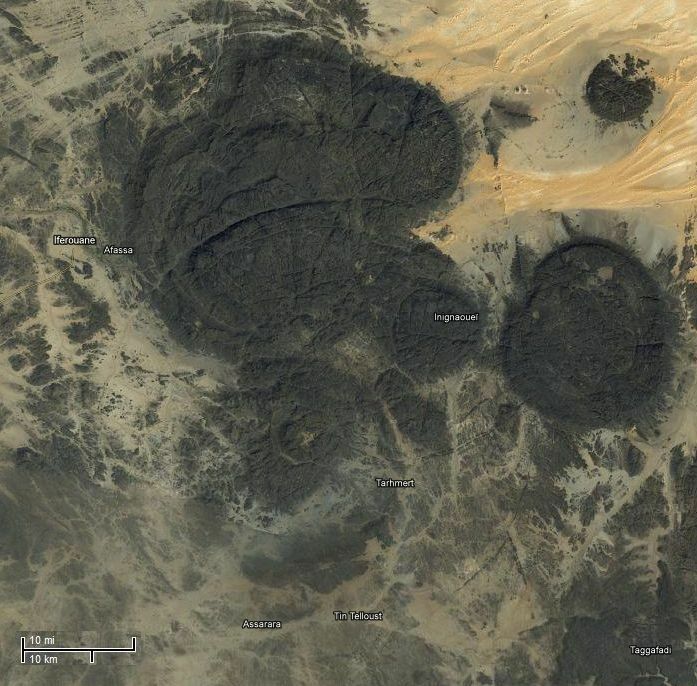 The circular areas near Tassessat, Niger appear to consist of three overlapping circles. The ridges at the boundaries of the circles indicate that the northernmost circle was formed first, followed by the central one, and then the southernmost as would be expected by a cluster of three meteorites falling in quick succession. The following table lists the impacts and the coordinates of their centers. The Timia-1 and Agessis-1 impacts are not shown in the figure above. Analysis of the Circular Features. A large meteorite falling on a crater created by a smaller meteorite will obliterate the smaller crater. The impact of a small meteorite in an area previously struck by a large meteorite may not form a crater because instead of hitting solid ground, it may hit molten crust created by the previous impact. The smaller meteorite may simply be engulfed by the molten rock. The same may be true for a large meteorite falling in an area that has been melted by a large number of smaller impacts. 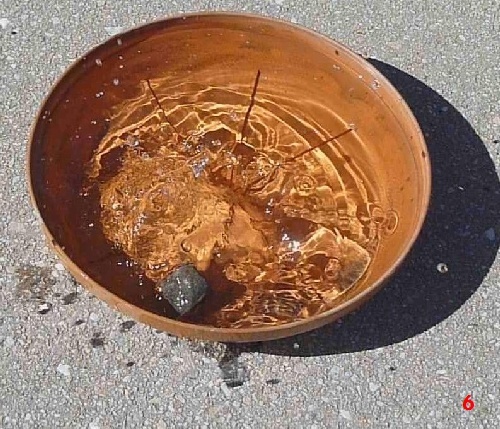 The only evidence remaining of a meteorite falling on molten crust may be the ripples left after the rock solidifies, and the resulting terrestrial morphology can provide clues about the sequence of the meteorite impacts. Impacts on the molten crust may not leave evidence of shock metamorphism such as brecciation and shatter cones that are typical signatures of single-meteorite crater formation. Overlapping impacts may provide a clue about the direction in which the meteorite cluster reached the Earth and the sequence in which the impacts occurred. Analysis of the overlaps is based on the principle of superposition used in lithologic stratigraphy and chronostratigraphy. The features in the Agadez region are arranged along a path going from Latitude:19.236215, Longitude:8.957986 to Latitude:16.761783, Longitude:8.460484. 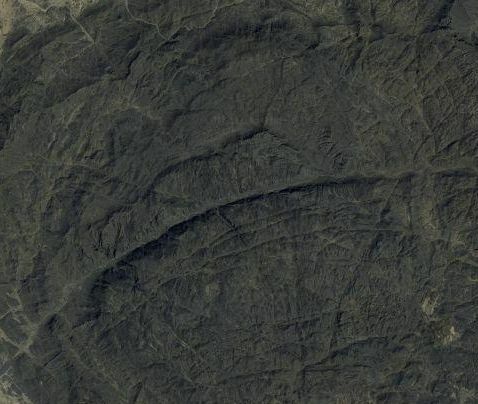 The fact that the northernmost circle near Tassessat (center at Lat:17.801334, Lon:8.756746) was overlaid by the second (center at Lat:17.768191, Lon:8.742659), and the second was overlaid by the third (center at Lat:17.694386, Lon:8.742492) indicates that the stream of meteorites impacted the Earth from north to south. This means that, in general, circles to the north are more likely to have been created earlier than circles toward the south. Through these mechanisms of terrain formation, it may be possible to determine the order in which the eight overlapping major impacts in the Inignaoueï area were created using as reference the following graphic with numbers that identify each circle. Figure 5. Intersection of circles 1, 2, and 3. Circles 2 and 3 were created after circle 1 since the circle rims of 2 and 3 overlay circle 1. Circle 3 may have been created after 2 because some material from the eastern edge of 3 appears to have covered the western rim of 2. Circle 2 must have been created soon after circle 1 since some lava oozed out in the northwest portion of circle 2. Intersection of circle 5 with circles 1 and 3. Circle 5, the 60-kilometer-wide circle, was created after circle 1 because its rim overlays circle 1. Circle 3 was also created after circle 1, otherwise, since it is a smaller circle, it would have been completely obliterated by circle 1. But notice that the rims of 1 and 3 rise within circle 5. This could only have happened if the rims of these circles formed when the surface was in a molten state. The mechanism of formation would be similar to the intersection of ripples created from multiple objects dropped into a fluid, as illustrated in Figure 7. The interaction of the circular waves provides evidence that the events that formed the overlapping circle rims happened almost simultaneously while the surface was melted. According to Principle Number 1, the largest impacts, which are circles 1 and 5, would have obscured the traces of any earlier smaller impacts. Therefore, it is not possible to know how many smaller meteorites preceded them, or how they were distributed on the underlying landscape. However, we can deduce that there was a substantial number of smaller impacts preceding 1 and 5 to liquefy the surface and this allowed the big impacts to generate the circular waves which produced the overlapping circle rims that we see today. This paper proposes: that the liquefaction of the surface, the formation of circular waves created by meteorite impacts on the molten surface, and the resulting overlapping circular rings are features that can be used to distinguish the impacts of a meteorite cluster from lava flows produced by volcanism. The fluid dynamics of the formation of the overlapping circles is complicated by the temperature-dependent changes in viscosity of the molten rock. At the western intersection of circle 3 with circle 5, Figure 6 shows that circle 3 continued expanding outside of the boundary of circle 5, but since the rim of circle 5 had already solidified, circle 3 could not expand within the boundary of 5. Thus, the material from the expansion of circle 3 accumulated as a bulge on the inside boundary of circles 5 and 1 from (Lat: 19.04, Lon: 8.56) to (Lat: 18.96, Lon: 8.61). The rim of circle 5 impeded the flow of lava to the northwest edge of circle 3 and prevented it from becoming perfectly circular. 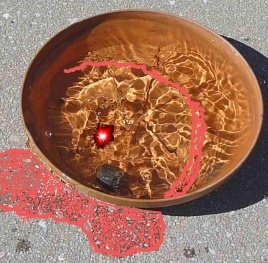 The fact that impact 3 almost formed a circle in spite of the barrier formed by the rim of circle 5 means that the force of impact 3 was transmitted partly through the molten lava and partly as a surface wave. Although the formation of circles 3 and 5 was essentially contemporaneous, the bulge structure suggests that circle 3 was created after 5. This chronology is further supported by the displacement of a portion of circle 5 at the eastern intersection of circles 3 and 5 (Lat: 19.127143, Lon: 8.826931) which may have been caused by the pressure exerted by the enlargement of circle 3 and higher temperature in that region of the impact that made the lava more fluid, see Figure 5. The speed of propagation of the circular waves also has to be considered, and it helps to confirm that circle 3 was formed after 5. The center of circle 3 is inside circle 5. 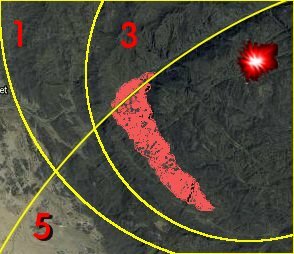 Did the impact at the center of circle 3 happen after circle 5 had reached its final position? Or did it happen while circle 5 was still expanding? We can determine that the impact for circle 3 happened after the rim of circle 5 had solidified, but while the surface was still molten. Figure 8 shows a splash zone on the outer edge of circle 5 from (Lat: 19.08, Lon: 8.58) to (Lat: 19.13, Lon: 8.70). It appears that the rim of circle 5 acted as a barrier over which flowed a portion of molten lava from impact 3. 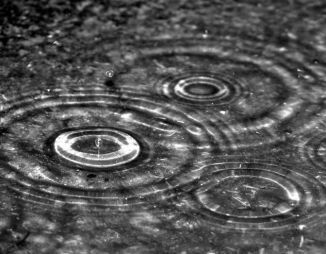 The fact that the center of the splash zone is closest to the center of circle 3 is a strong indication that the force that caused the splash originated at the center of circle 3. Ejection of lava by an impact also explains why the Aïr ring structure is so prominent. 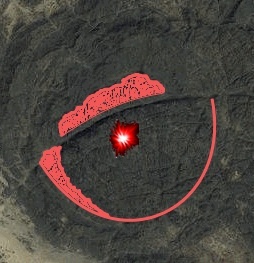 The impact that formed circle 3 eliminated the lava that had accumulated adjacent to the edge of ring 5 by ejecting some lava to create a splash zone, and by pushing away some lava to form a bulge. Close examination of the bulge at the intersection of rings 3 and 5 shows that the waves created by impact 3 forced lava to spill over the rim of circle 5 and pour down the outside edge of the rim at Lat: 19.044, Lon: 8.563 (Figure 8a). The splash of lava over the rim of circle 5 provides the most convincing evidence that the Aïr formations were caused by meteorite impacts. Figure 9 illustrates the generation of a splash by an impact, and the formation of a splash zone is analyzed in more detail in Figure 12. Figure 8. Intersection of circles 3 and 5. Figure 9. Splash generated by an impact on a liquid. The liquid spilled outside the container will create a splash zone. The splash mechanism is analyzed in more detail in Figure 12, below. Figure 10. Intersection of circles 4, 5, and 6. Circles 4 and 6 were created after circle 5, as determined by the overlay of the borders of 4 and 6 on the surface of 5. 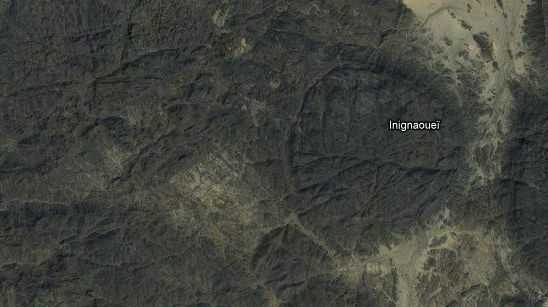 Also, the impact of circle 4, which is the circle on which Inignaoueï is located, seems to have dislodged a portion of the rim of circle 5 toward the northeast. 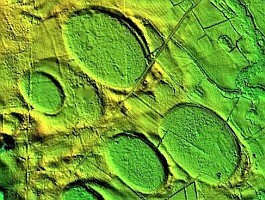 The rim feature of circle 5 at Lat: 19.028687, Lon: 8.976961 is about one kilometer further from the center than other parts of the perimeter of circle 5. Figure 11. Intersection of circles 5, 7, and 8. Circle 7 was created after circle 5. It also appears that 7 was created after 8. Since circle 8 does not intersect circle 5, it cannot be determined if 8 was created after 5. The published literature has descriptions of many types of isolated meteorite impacts, but there is no mention about impacts by a dense meteorite cluster. Verification of an impact origin typically requires the discovery of unique impact-produced features such as brecciation, shatter cones, petrographic shock effects, or distinctive geochemical signatures in the rocks of the structure. 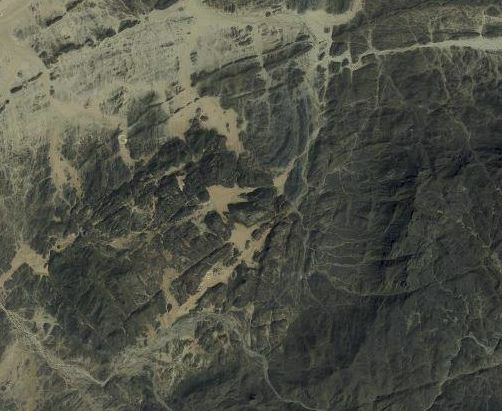 The Agessis-1 feature (Taghouaji Massif) in the Aïr Mountains has been reported to contain breccia, although it is not known whether it is from the result of an impact. This paper discusses the differences between a single meteorite impact and the multiple adjacent impacts of a meteorite cluster to provide support for the idea that the circular features of the Aïr Mountains in Niger may be explained as the result of the impacts of a dense meteorite cluster. The explanation considers that a barrage of impacts liquefies the surface, and that the only clues remaining are the largest impacts and the smaller impacts that follow them. In the case of meteorite cluster impacts, the interpretation of the geological features has to rely on the fluid characteristics of the molten surface to differentiate impact events from volcanic events. This paper suggests that the circular waves and the splash patterns created by impacts on the melted crust offer a way to determine the sequence of meteorite impacts and distinguish the impacts of a cluster of meteorites from lava structures created by volcanic events. However, there is the possibility that a sequence of meteorite impacts of sufficient intensity may trigger magmatic events that make the interpretation of the resulting structures more difficult, as appears to be the case for the Aïr Mountains. The elevation of many of the features is different today from what would be expected after the impacts occurred. It is likely that the centers of the areas where the major impacts occurred remained hot and were more easily uplifted by magma; thus, the basin of some rings is higher than the rims. The cause–effect relations between extraterrestrial bombardment and major tectonic and igneous events has been discussed by Glikson. Application of the meteorite cluster impact hypothesis to the structures of Aïr Massif makes it possible to identify the sequence in which some of the meteorites impacted the Earth, and it also provides an explanation for how the great Meugueur-Meugueur ring structure was formed. Additional deductions can be made about the temperature distribution of the surface, and perhaps about how much time elapsed between the meteorite strikes based on how some structures created by early impacts reacted to subsequent impacts. Further analysis may provide leads about additional impacts that are not evident from this gross examination. 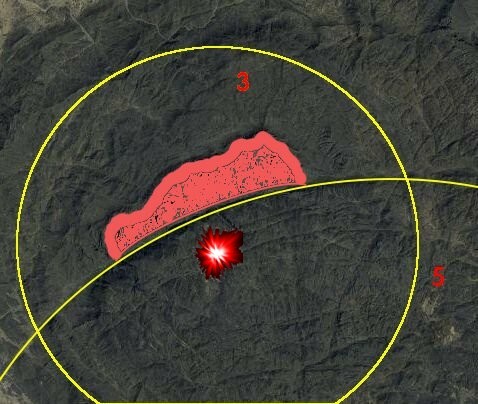 In particular, a circular arc from Lat: 18.932751, Lon: 8.643535 to Lat: 19.017247, Lon: 8.765090 may indicate an impact that followed 5 and then was overlaid by 6. There are also two smaller circles that were overlaid by 6: A 6-kilometer circle with a center at Lat: 18.880376, Lon: 8.850997, and a 9-kilometer circle with a center at Lat: 18.822472, Lon: 8.876562. The circular 8-kilometer feature with center at Lat: 18.819393, Lon: 8.730016 has to be investigated further. Although it appears like an impact crater, its location at the center of the 60-kilometer impact makes it a candidate for a central uplift formed by the big impact. In Niger, the Impact Database lists an unnamed 10-km crater at (Lat: 21.353, Lon: 9.145), and two small craters, Azenak East with a 1 km diameter, and Azenak West with a 0.5 km diameter at (Lat: 16.5, Lon: 8.0). These three previously-reported impacts appear to be along the same line of flight as the sites of the meteorite cluster reported here. It is possible that they were also members of the same cluster. The determination of the line of flight is important because the center of mass of the original object from which the meteorites were derived must lie along that path. If some large objects are found substantially to one side of the line of flight, there must be others, equally massive, on the opposite side. Additional insights may be gained by computer modeling or by using physical models to study the formation and interaction of waves created by objects of different sizes dropped at varying times into containers filled with clays, slurries or other liquids with different viscosity attributes. 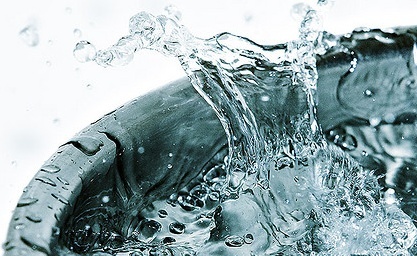 The series of photographs in Figure 12 demonstrates that an impact on a liquid can produce two splashes. 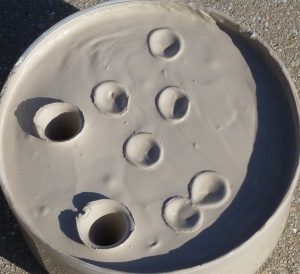 The first splash occurs when a cavity is made as the object penetrates the liquid – the excavation phase (Frames 2 to 6). 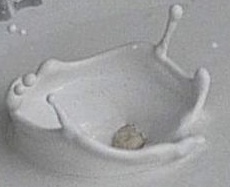 The second splash is made when the liquid collapses to fill the void created by the impact – the remodeling phase (Frames 7 to 14). Frame 5 shows the circular ring made by the initial shock wave that sends the first splash over the rim. Frame 10 shows the circular surface wave that sends the second splash over the rim. Although the object that produced the impact is displaced from the original location of the impact, the waves radiate from the point of impact. Frame 16 shows the splash zone adjacent to the point of impact as the only evidence of the impact — notice that the middle of the splash zone is closest to the original point of impact. Move the cursor along the thumbnails for a detailed view. Figure 12. Splash zone generated by two splashes from one impact. Please enable scripting for your browser and re-load the web page. The fact that an impact produces an initial shock wave followed by a surface wave can be used to explain the feature in the northwest of circle 1, where the surface wave of circle 1 seems to have been prevented from expanding to the edge of circle 1. Figure 13 shows circle 10, an oval 8 by 4.7 km impact inside circle 1 at Lat: 19.27, Lon: 8.55, that must have occurred after the initial shock wave of the excavation phase, but just before the arrival of the surface wave from the remodeling phase. The force of the smaller impact would have created its own circular wave that met the oncoming surface wave of circle 1. As the waves met, the height of the waves was reinforced to form a bulge around the small impact, and the lava solidified almost immediately. 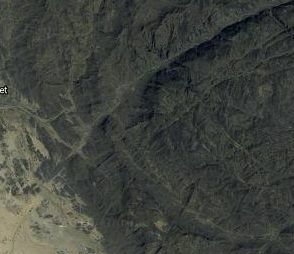 The rim of circle 1 is clearly seen in this image, but there is a lot of erosion outside the rim, so it is difficult to identify a splash zone. Figure 13. Northwest area of circle 1. The meteorites that formed the ring structures in the Aïr Mountains most likely originated from a comet that disintegrated as it entered the Earth's atmosphere rather than from a comet that split apart from gravitational forces prior to impacting the Earth. The lava splashes and overlapping rings indicate that the lava had to be at a very high temperature and very fluid when the impacts occurred. This means that the impacts happened in very quick succession. If the fragments of the comet had been separated by large time intervals they would not have created an overlapping pattern due to the fast surface rotation of the Earth, about 32 kilometers per minute, at the end of the Cryogenian Period when the length of a day was 20.7 hours. If the impacts had occurred at intervals of three minutes, the individual craters would have been separated from each other by 96 kilometers. To produce the overlapping circles, all the impacts had to occur within about one minute. The following table summarizes the approximate sequence in which the meteorites impacted the Earth based on the principles of the meteorite cluster impact hypothesis and the analysis of the overlapping features. Circle 9 is not included because it does not overlap with other circles. Circle 8 could have been formed before circle 5, but the fact that a trace of its rim appears within circle 7 indicates that 8 and 7 are contemporaneous, and 7 was definitely formed after 5. The relative sequence of circles 4 and 6 is not known, but circle 6 was formed after circle 3 because the circular arc from Lat: 18.932751, Lon: 8.643535 to Lat: 19.017247, Lon: 8.765090 overlays a portion of circle 3, and the arc is overlaid by circle 6. Circle 4 and circle 6 both overlay a small 6-kilometer circle with a center at Lat: 18.880376, Lon: 8.850997, so this makes 4 and 6 contemporaneous. As illustrated in Figure 14, the circular feature of the Aïr Mountains with center at Lat: 19.078849, Lon: 8.672479 has many characteristics in common with Frame 11 of the splash experiment (Figure 15). The splash zone and the overlapping rings of the Aïr Mountains are consistent with a model of impacts on a molten crust, but the established science of impact verification requires evidence of shocked and brecciated rocks, shatter cones, and planar deformation features in quartz. 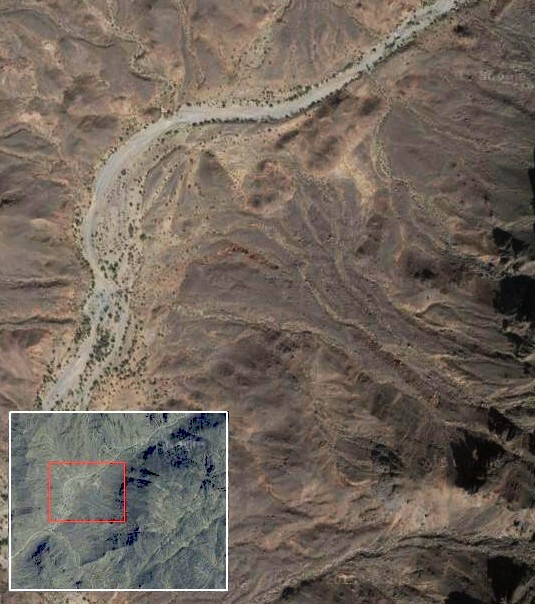 Given the intensity of the bombardment that resulted in the melting of the crust of the Aïr Mountains, it is unlikely that this type of evidence could have been preserved within the impact zone, particularly if the impacts triggered a magmatic event. The search for evidence of shocked materials from the initial impacts on solid ground is likely to be more successful in the peripheral areas of the impacts where some of the fragmental ejecta, microtektites, microkrystite spherules, and shocked material might have survived, although this material may have been altered by diagenetic processes. The portion of the uplifted rim of the 60-km impact exposed at Lat: 18.6405, Lon: 8.9640 might provide useful clues, but it may not yield material with shock effects that is usually found in deposits of crater-fill breccia, in subcrater rocks and central uplifts of impact craters. Aïr Massif has been described as being of Precambrian or Palaeozoic origin in the published literature. [2, 5] This represents a large time span that will need to be made more precise. It will be necessary to correlate the age of the structures with the effect that such meteorite impacts might have had on Terrestrial life. The geomorphology of Aïr Massif has been shaped by a complex combination of events that makes it hard to date the formations. If the Aïr Mountains were created by impacts from a meteorite cluster, the energy release from all the combined impacts described here might have been comparable to the energy from the impact that ended the era of the dinosaurs. The calculation based on crater diameter gives a combined energy release for the impacts that created the first nine Inignaoueï circles of 9.3×1021 Joules which is equivalent to 2,220 megatons of TNT. In addition, if the meteorite cluster originated from the disintegration of a comet, a large amount of gaseous components could have altered the atmospheric composition of the Earth. The oldest date of formation for the Aïr Mountains of 660 Ma based on K-Ar dating provided by Brunnschweiler might associate the event with the end-Cryogenian mass extinction 650 million years ago which is currently attributed to the "Snowball Earth" hypothesis. It may be possible to provide support for the impact hypothesis based on the viscosity of the lava and its time of emplacement. A very fluid lava with viscosity similar to water would have had a temperature of approximately 1600°C. Such low viscosity lavas were typically produced by geological processes before the mid-Paleoproterozoic Era (>2.0 Ga) when the interior of the Earth was still very hot and komatiite lavas were deposited. Any lava structure created at such high temperature in the Aïr Mountains, which were formed after 660 Ma, is likely to have originated from an impact because by the Neoproterozoic Era the Earth's crust had cooled sufficiently that such high lava temperatures could not be produced by volcanism. 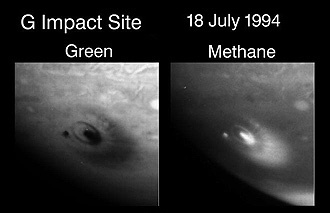 The following examples of impacts on Jupiter and on the Moon are used to provide support for the ideas that 1) a comet can break up to form a meteorite cluster that produces multiple impacts along the line of flight of the cluster, and that 2) impacts on a molten surface do not leave the same kind of evidence as impacts on a solid surface. The disintegration of a comet into a cluster of meteorites before an impact may actually be a very common cosmological occurrence. Comets are celestial objects consisting of rocks and dust held together by a matrix of frozen gases. When comets get close to the Sun as they travel in their highly elliptical orbits, the gases evaporate and some of the dust separates to form a nebula of particles known as the coma. If enough of the matrix melts or evaporates, gravitational forces may break up the comet into a meteorite cluster. The comet Shoemaker-Levy 9 broke apart before crashing into Jupiter in July of 1994. 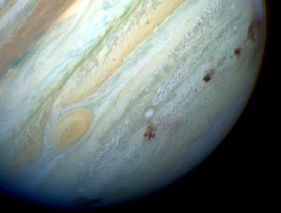 The following pictures from the Hubble Space Telescope show the trail of impacts on the surface of Jupiter along the line of flight of the comet, and details of Impact Site G. The gaseous components released by the comet created large atmospheric disturbances that appeared as dark spots and were likely caused by hydrogen cyanide polymers. The impacts would have been closer together if the disintegration of the comet had happened nearer to Jupiter or if the angle of the collision trajectory had been more perpendicular relative to the planet surface. Dark spots in the atmosphere of Jupiter show the impacts along the line of flight of the comet. Impact Site G shows one large and one small impact through a green and a methane-based filter. 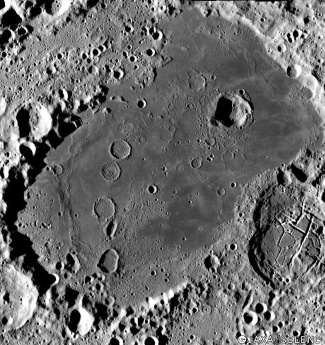 Mare Moscoviense, on the far side of the Moon, has many features in common with the Aïr Mountains. Figure 19 shows three major overlapping circular areas. The largest circle is approximately 160 kilometers in diameter, and the three circular areas are within the Moscoviense basin which is a larger circular area with a diameter of 445 kilometers. Unlike the Aïr Mountains, there are no overlapping rings. The traces of lava flow that form the flat surface have been dated at 2.6 Ga, and have been described as the result of volcanic activity that continued for at least 1.5 Ga following the formation of the Moscoviense basin. [12, 13] However, it is unlikely that the Moon would spontaneously have endogenic lava flows after more than one billion years of being volcanically inactive. It is more likely that the melting occurred as the result of impacts from a cluster of meteorites. One of the features that indicates contemporaneous multiple impacts on a molten surface is the plastic deformation of overlapping rims of adjacent impacts. 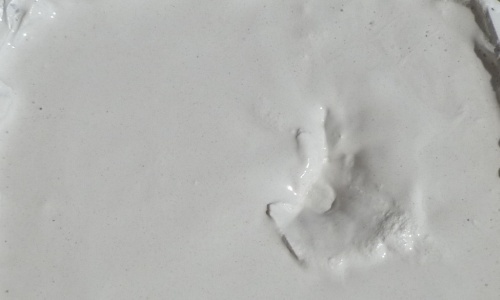 Mare Moscoviense shows impacts on a molten surface and on a solid surface. 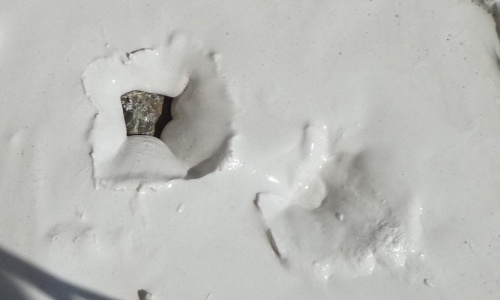 Figure 21 shows impacts made by five pebbles approximately 5 millimeters in diameter dropped from a height of one meter into a cup of plaster of Paris slurry. 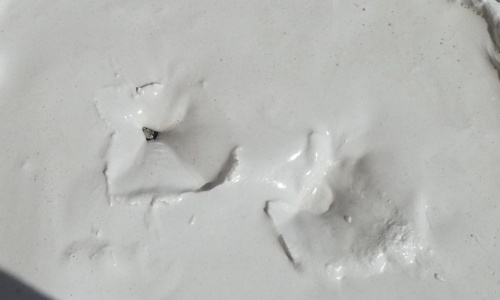 The impacts were made at different times as the plaster hardened. 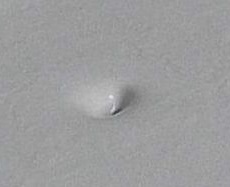 The first impact made an almost imperceptible circle or "ghost crater". The second and third impacts left just faint ring impressions because the plaster was very fluid at the time of the impacts. The ejecta from the fourth impact made a well-defined ring, but the plaster was still fluid enough to fill the cavity made by the impact. 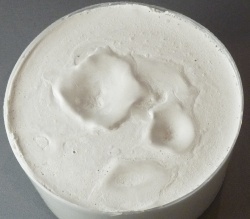 The fifth impact, although smaller than the fourth, is deeper because the plaster was less fluid and could not flow readily to fill the area of impact. 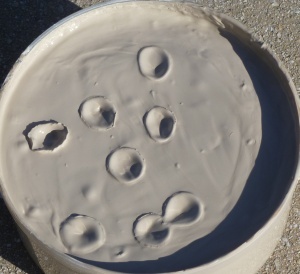 Figure 22 illustrates an impact on a very fluid plaster slurry, two impacts on a thicker slurry, and several impacts on soft clay. 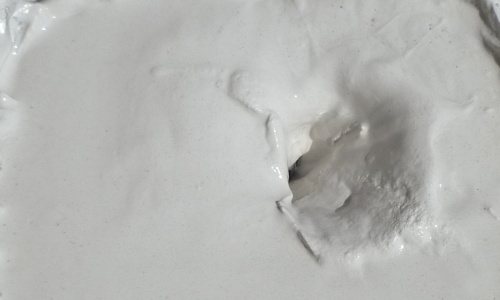 Although a slurry of plaster of Paris is quite different from molten lava, the experiment illustrates some of the basic physical principles of impacts on viscous fluid surfaces: 1) an impact on a viscous fluid surface creates a rim and 2) the cavity made by the impact is filled by the fluid leaving only the salient rim as evidence of the impact. Figure 21. 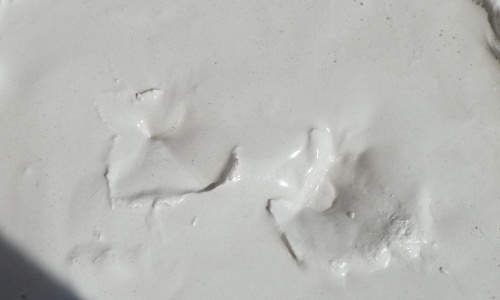 Five impacts on a plaster slurry. Figure 22. Mechanism of ring formation followed by filling of the impact cavity. The prominence of the ring structure depends on the fluidity of the surface at the time of impact. even as the cavities of new impacts are filled. 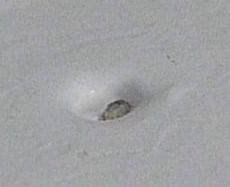 Figure 22a shows experimenal oblique impacts on clay that produce oval structures having an accumulation of material on the distant side of the rim along the direction of the impact. Figure 22b is an example of some Carolina Bays with similar characteristics. 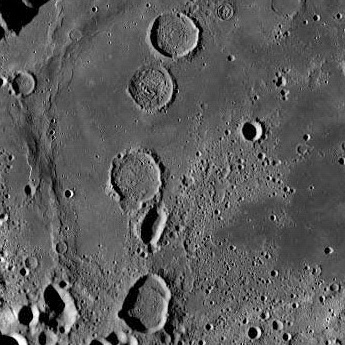 Many geologists and astronomers consider the craterless rim structures, such as seen in Mare Moscoviense (Figure 20), to be the result of lava flows that fill the cavities created by previous meteorite impacts. The alternative hypothesis that the craterless rims are the result of impacts on a molten surface is usually not considered. 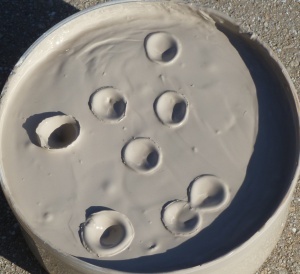 Figure 23 shows an experiment with clay that simulates the filling of previously existing craters by an endogenic lava flow. The emerging lava has to create a lava dome which is high enough so that the lava can flow horizontally and fill the features at lower levels. The level of the lava must rise above the rims of the craters in order to fill the craters, and as the craters are filled, the path of the lava flows into the craters creates very specific features. The morphology of the resulting structures is very different from the impacts on a viscous fluid. Mare Moscoviense does not show evidence of a lava dome as a source of an endogenic lava flow, and the rims in the middle of the Mare have not been breached by external lava flow. The interior of the craterless rims do not show the paths of any lava flows into the craters. The craterless rims of Mare Moscoviense have a greater similarity to impacts on a molten crust than to craters filled by endogenic lava flow. to overflow the crater rims. Below is an interactive map from Google of the area around Inignaoueï, Niger. You can zoom the image (click + or -) and navigate by clicking the arrows or by dragging the image (hold left mouse down while moving the cursor). "In the Aïr Mountains of the central portion of northern Niger, no dates older than 660 m.y. have yet been found, although a complex Precambrian history is suspected from geologic studies; the Pan-African event (about 600 m.y. ago) has strongly overprinted earlier features." "The [Aïr] mountains are composed of granitic and metamorphic crystalline basement rocks which emerge through the surrounding Carboniferous to Cretaceous sediments and are overlain in places by end-Cainozoic lavas. An end-Cretaceous fault-trough extends into the heart of Aïr and, together with other evidence, indicates that the crystalline rocks were buried during the Cretaceous marine transgression. Geological and geomorphological evidence suggests deformation and uplift in end-Cretaceous, end-Palaeocene and end-Tertiary-Pleistocene times." A.Glikson, J. Vickers, The 3.26-3.24 Ga Barberton asteroid impact cluster: Tests of tectonic and magmatic consequences, Pilbara Craton, Western Australia, Earth and Planetary Science Letters, Volume 241, Issues 1-2, 15 January 2006, Pages 11-20, ISSN 0012-821X, DOI: 10.1016/j.epsl.2005.10.022. French B. M. (1998) Traces of Catastrophe: A Handbook of Shock-Metamorphic Effects in Terrestrial Meteorite Impact Structures. LPI Contribution No. 954, Lunar and Planetary Institute, Houston. 120 pp. J.B. Perez, Y. Dusausoy, J. Babkine, M. Pagel, Mn zonation and fluid inclusions in genthelvite from the Taghouaji complex (Aïr Mountains, Niger) American Mineralogist, Volume 75, pages 909-914, 1990. 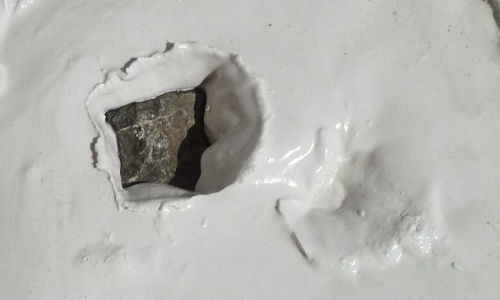 Bevan M. French, Christian Koeberl, "The convincing identification of terrestrial meteorite impact structures: What works, what doesn't, and why" Earth-Science Reviews, 98 (2010) 123–170. Morota, T., et al. (2009), Mare volcanism in the lunar farside Moscoviense region: Implication for lateral variation in magma production of the Moon, Geophys. Res. Lett., 36, L21202, doi:10.1029/2009GL040472.